Before the rain I cry aloud________. I pick and eat all the mice. Tuk-tuk-tuk I work all day. Dear crow why is there so much noise in the jungle? I just cannot sleep. Dear Owl, the birds are all praising themselves and shouting. The owl said – Stop this hullabaloo. Why are you quarrelling? We are all special in our own ways. 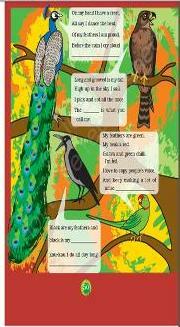 Our claws, beaks, feathers and sounds are different yet we are all birds. If we all looked alike, ate the same food and made the same sounds, think how dull the world would be. Bird’s beaks are very important. They help the bird collect the food and sometimes they rip, tear, or crush food. They can act as an extra hand, such as when parrots use their beak for climbing. 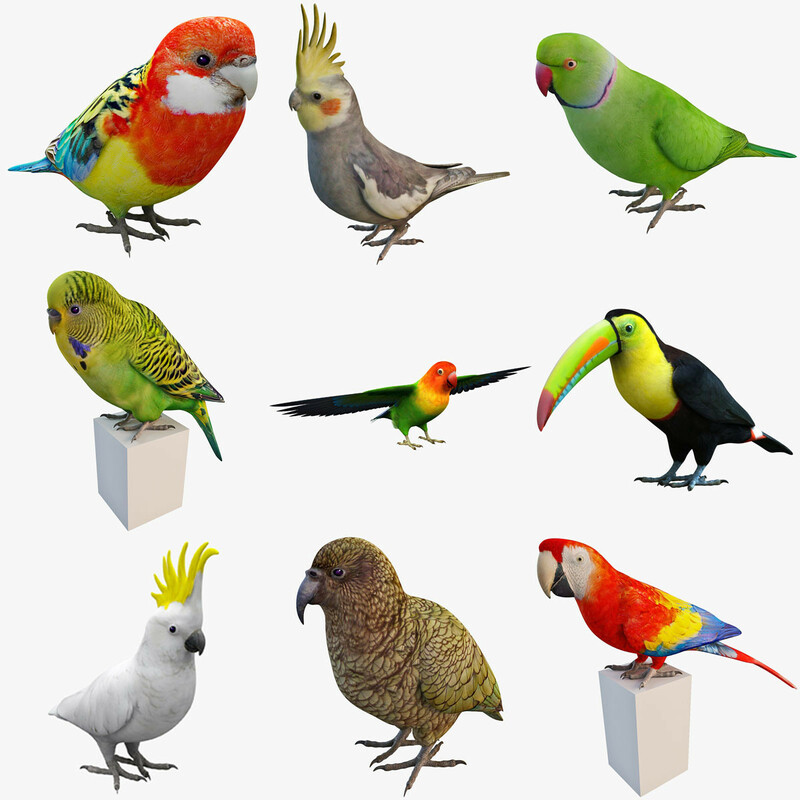 They are used for building nests, and in some birds like tailor bird use their beak for tie knots. An acute beak is one that tapers to a fine point at the end. This type of beak is delicate, and can be found in many insect eating birds such as warblers. A decurved bill is one that curves downward. 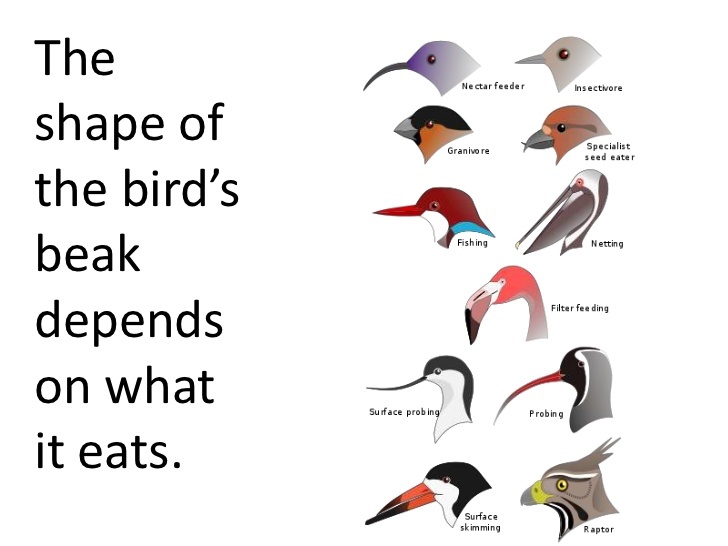 The creepers are one type of bird that have this type of beak. The curve helps them pulls insects out of the bark of trees. Ducks have being aquatic birds, ducks have flat beaks that help strain the water from the sides when they consume food which includes aquatic plants and animals. A long beak is much longer than the head. This type of beak helps the bird grab food that might otherwise be out of reach. Woodcocks, for example, use their long beak to probe for worms in mud. Toucans use their long beak to pick fruit in trees. Herons use their long beak to catch fish. The shape of the beak is cylindrical in shape, it looks like a circle as you look straight at it. This type of beak is found in the hummingbird family. 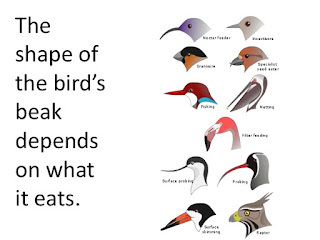 Just as birds have different types of beaks, they also eat different types of food. While some eat fruits, some eat seeds. Some eat eggs, while others eat fish. Have you ever noticed that birds fly and walk in different ways. Their neck movements also differ. The mynah moves her neck back and forth with a jerk. The owl can rotate its neck backwards to a large extent. There are some birds which can imitate our voice. 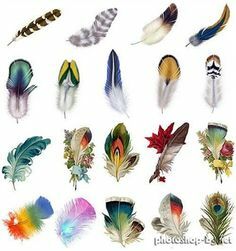 The feathers of birds are of different colours, shapes and sizes. Their feathers help them to fly and keep them warm too.